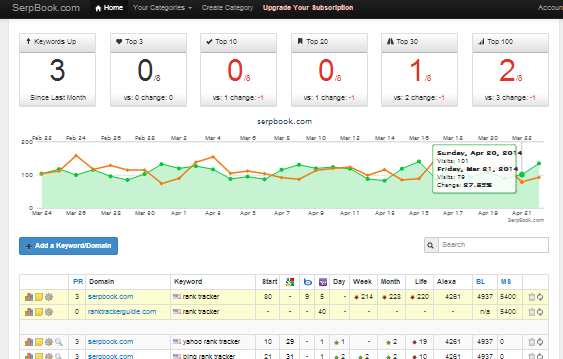 Your Google Analytics account can be directly integrated into SerpBook through here. We would report the number of organic visitors visiting your site each day. The Google analytics stats is calculated monthly, but is based on ORGANIC visitors only. We're currently pulling the ga:organicSearches value from Google Analytics for this integration. To get started, click on the "Connect Me" button to link your Google account to SerpBook. 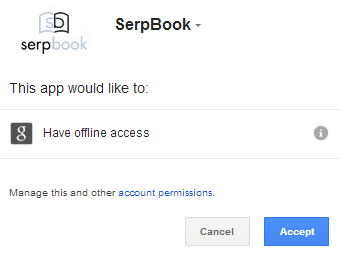 The next step is to grant permission for SerpBook to view your Google Analytics account. Select your Google Analytics Profile then click on "Submit". If you are satisfied with the result of the graph, you can then save this profile onto your SerpBook account by clicking on "Save this Ga Profile". Once you have saved your Google Analytics profile onto your account, you can either iFrame the ViewKey directly onto your site, or associate it to a category. 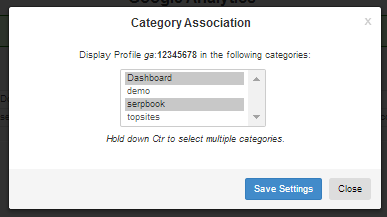 You have the option to associate it with any amount of categories and your SerpBook dashboard as well.